Never let it be said that I don’t take the Gazette’s readers into the exclusive places! Case in point, as we’re continuing our exploration of the Jungle Navigation Co. Ltd. Skipper Canteen we’re venturing into the restaurant’s restrooms! Specifically, we’re looking at the bulletin board above the urinal where you can read the latest headlines from Adventureland’s marquee publication, The Daily Gnus. In 2014, Disneyland launched the Juju hunting game based out of the Adventureland Trading Company. The game required guest to find clues and collect various Jujus tied to specific skills needed to survive in the jungles of Adventureland. These skills included Courage, Discovery, Friendship, Goodwill, Humor, Knowledge, Observation, Storytelling, and Tracking. The tracking skill resulted in guests procuring the Elephant Juju after purchasing a copy of The Daily Gnus and finding the clues in it. For those of you who were unable to partake in the game at Disneyland, you can still read the front page of The Daily Gnus’ special edition in the Skipper Canteen restroom. It may inspire you to go… deeper and deeper into the jungle! For those of you reading along at home, I put it to our social media followers as to which of the paper’s stories they’d like to read here. 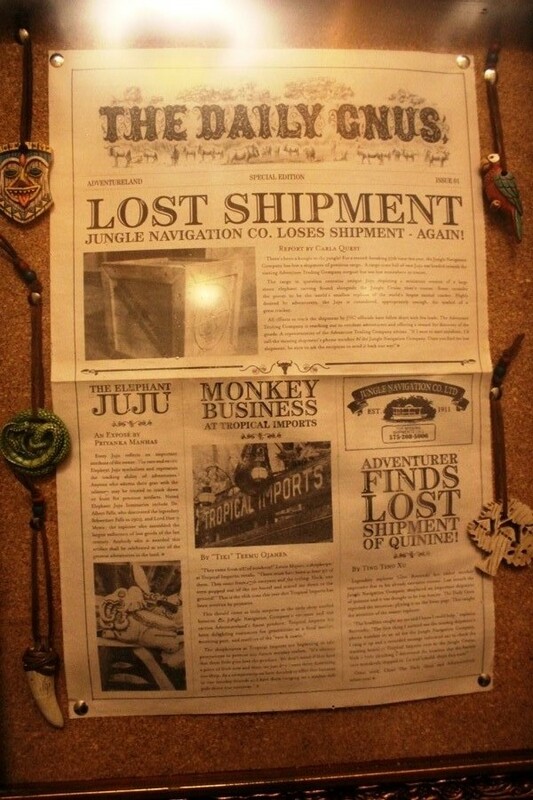 The headlines included Lost Shipment: Jungle Navigation Co. Loses Shipment – Again!, The Elephant Juju: An Expose, Monkey Business at Tropical Imports, or Adventurer Finds Lost Shipment of Quinine! Voting was fairly close, but since we’re talking Elephant Juju and The Daily Gnus, the tie breaker goes to the Tracking Juju. Every Juju reflects an important attribute of the owner. The rare and exotic Elephant Juju symbolizes and represents the tracking ability of adventurers. Anyone who adorns their gear with the talisman may be trusted to track down or hunt for precious artifacts. Noted Elephant Juju luminaries include Dr. Albert Falls, who discovered the legendary Schweitzer Falls in 1903, and Lord Henry Mystic, the explorer who assembled the largest collection of lost goods of the last century. Anybody who is awarded this artifact shall be celebrated as one of the greatest adventurers in the land.